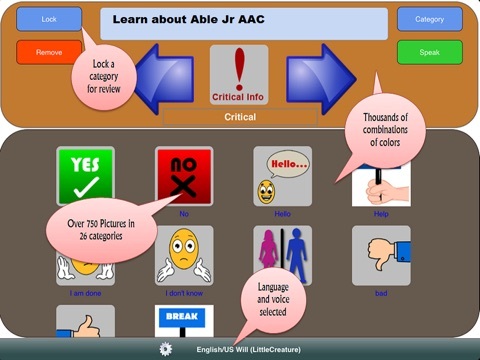 Able AAC Free is a application to help potential users evaluate five of our paid apps. 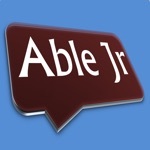 Able Jr, Able, Able2Talk, Able HD AAC and My Daily Tasks. You will be able evaluate usability, functionality and capability. Each language has video in youtube. Type "Ablevox" in the youtube search bar. 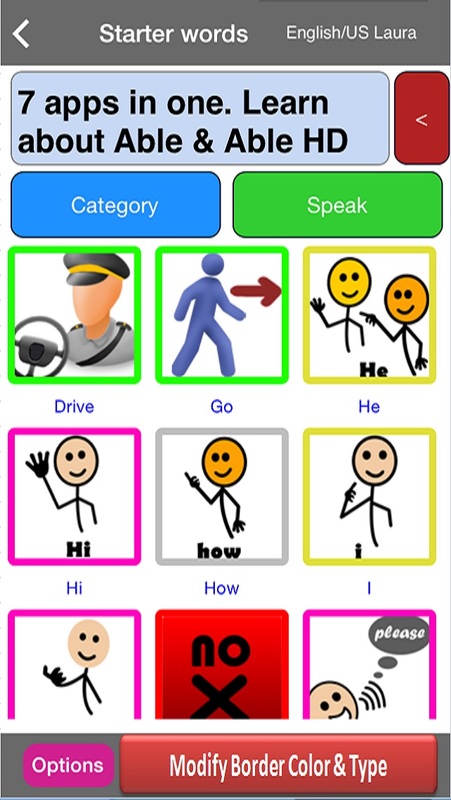 "So, take note that with a plethora of features and natural-sounding Acapela Voice Engines and language packs, Able AAC is more than just another communication app! Bravo!" 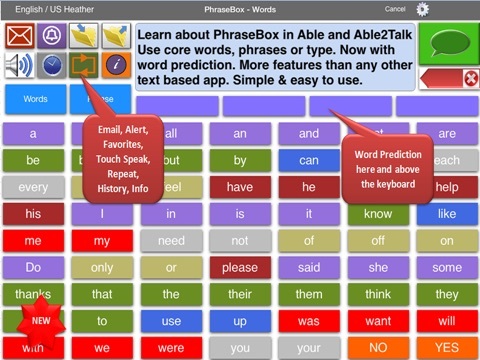 Review by Jack at Autismpluggedin. *Over 48 phrases. 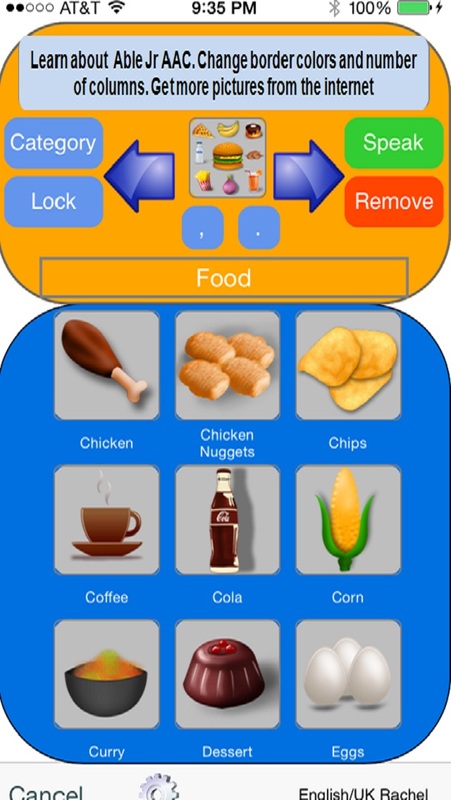 One touch explains your needs and its completely configurable. 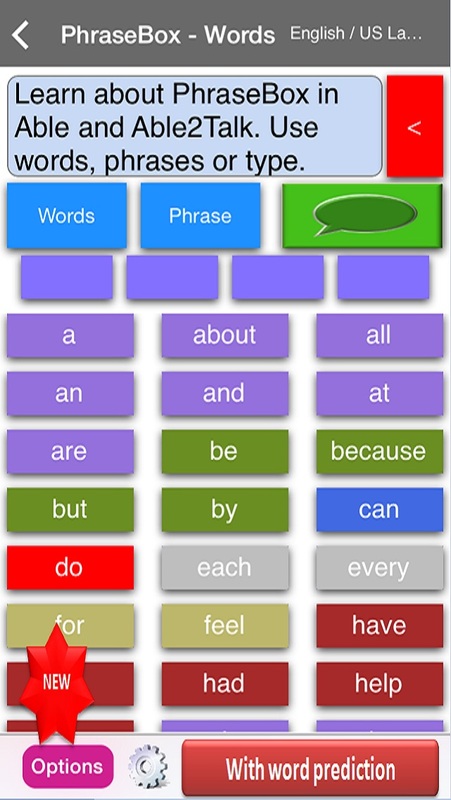 * Create a sentence using 150 core words with 620 fringe words available. Voices have been deactivated for this app. 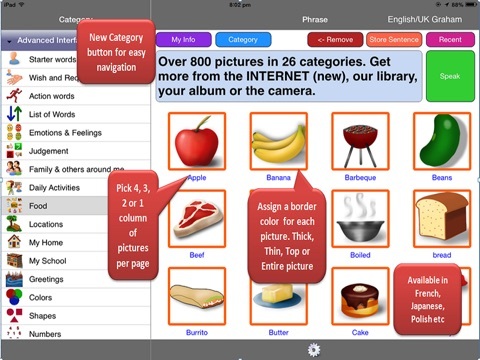 * Convenient to learn shapes, colors numbers, year, month. 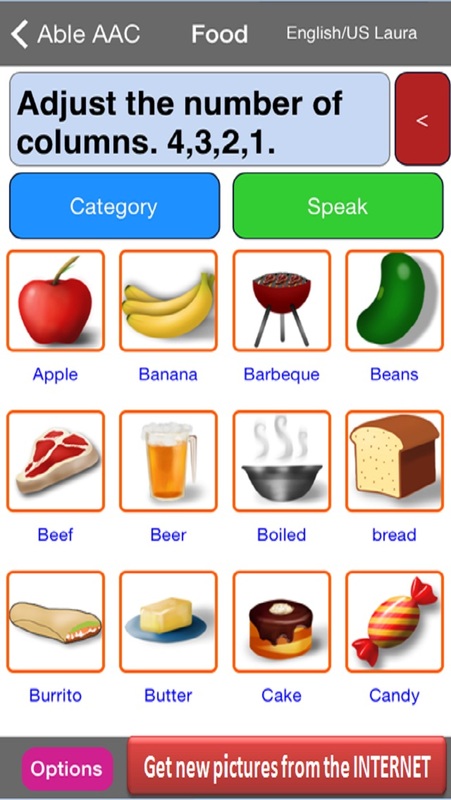 * You can learn future, past and present tense in some categories. * Check out some voice samples in My Audios. 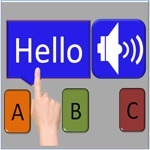 * Voice speed and voice shaping can be configured. * Cannot find the language you want on our list. Create your own using one of the apple keyboards. 57 keyboards available from Cherokee to Vietnamese. 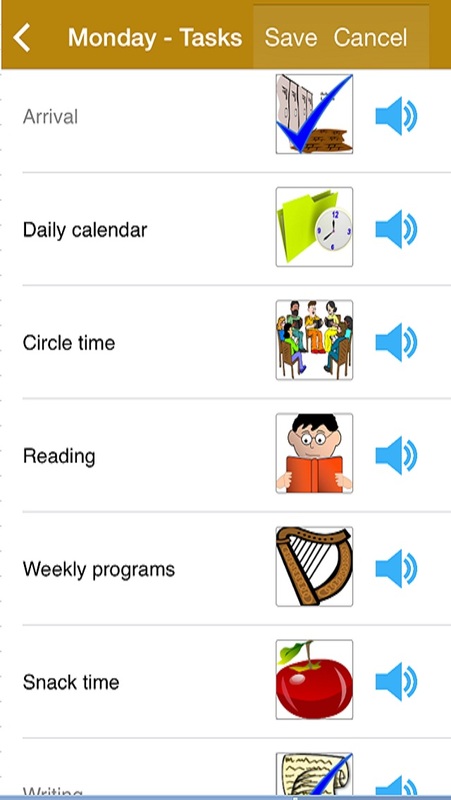 Enter any language text and record a voice and now you have a complete AAC solution in your language. 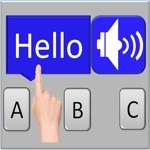 *Type or copy/paste whatever you want and press the green speak button. 5 categories. 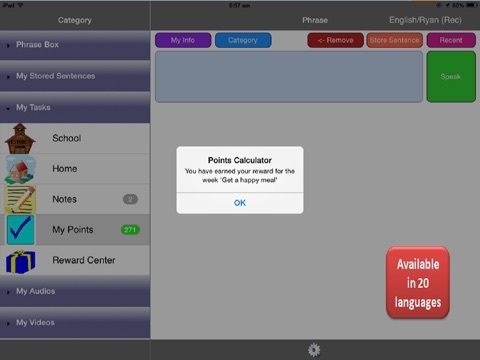 School, Home, Notes, My points, Reward Center. 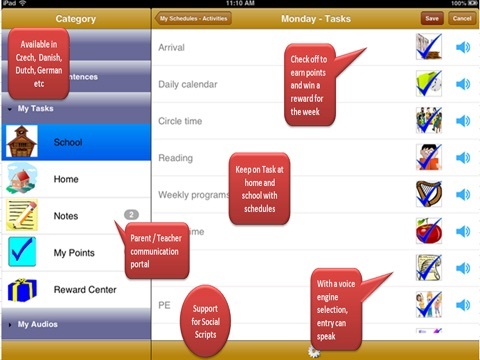 * Notes is a communication tool between the teacher/care giver and parent/ guardian. If there are any new notes, a counter with the number of new notes will be shown. * My Points shows the number of points accumulated so far and when touched lets the user know whether the reward threshold is reached. * The Reward center allows the parent or guardian to raise or lower the threshold and change the gift. * There is also 2 reports generated each week. 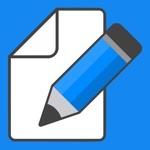 The reports are generated on Monday morning and all checked items for the previous week is unchecked, leaving a clean slate for you to check off for the new week. The goal is to see the points rise every week when unacceptable behavior is taken out of their repertoire. *These two categories are used to help view or listen to unique content generated by you. Like a tying a shoe lace or holding a pencil properly.